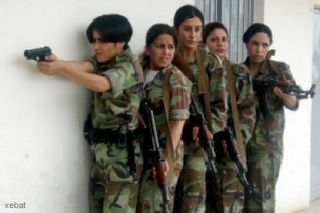 Kurdish peshmerga women training for combat. 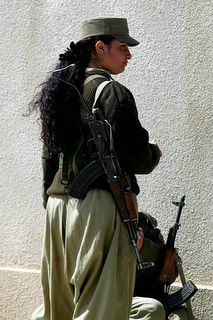 If revenge is a dish best served cold, then the fresh-faced recruits of the Peshmerga Force for Women cannot wait for the Kurdish winter to set in. 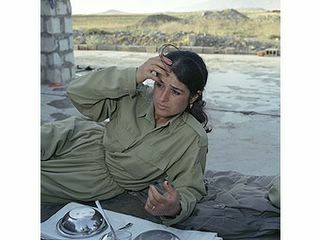 That’s when they believe a US attack on Iraq will happen, allowing them to put into practice all they’ve learned at the training camp for peshmerga – meaning those who face death – outside the Kurdish city of Sulaymaniyah in the self-rule area of northern Iraq. 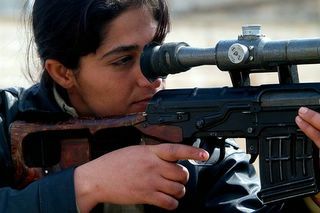 At the academy, run by the Patriotic Union of Kurdistan, 20 young women are being schooled in the arts of attack, ambush and sabotage, and learning to use Soviet-era weapons. (This was before Operation Iraqi Freedom. 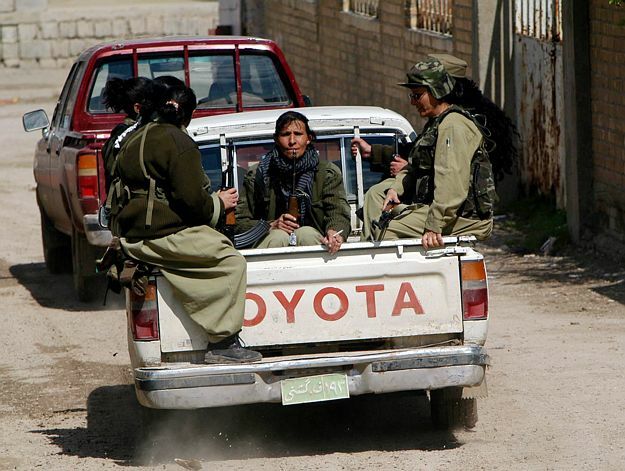 Today they are still training women to fight in northern Iraq.) Soon they hope to apply these arts of war against the regime held responsible for the murders and disappearances of their loved ones. 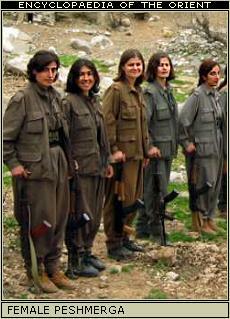 Peshmerga Fighters prayed for the Day of Freedom for Iraq. 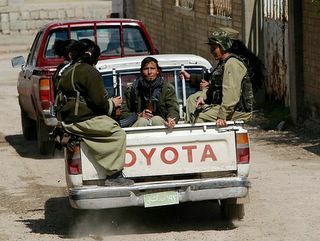 “Men get the full force of the dictatorship’s brutality in this country, but women end up suffering the results,” said Shams Mahmoud, a commander of the women’s force, which was established six years ago and now boasts more than 300 fighters. Obviously, there are no hair requirements. …The U.S.-led coalition and its handpicked Iraqi Governing Council, however, have other ideas. American administrators in Baghdad have repeatedly said paramilitary forces have no place in the new Iraq. After contentious debate, (in 2004) the council last week decided to allow peshmerga to keep their weapons — but only as part of a National Guard-style force. The officers of a Kurdish guerrilla unit drank tea and laid out in vivid detail what they would do to President Bush if he fell into their hands. “I would kiss him one thousand times,” the company commander, Sheikh Fattah, said. “I would carry him on my shoulders and shout songs to him,” another officer, Farouk Khaled, added. “I would sacrifice one thousand sheep and two thousand chickens for him,” a third officer, Mam Siamand, said. Kurdish Northern Iraq still continues to train women for their military. Off to the battle field.